Look, Look, Spots and More Spots! Welcome to Dynamicat Cattery - Ocicats we are CFA and TICA registered. Our cattery has received the TICA, Outstanding Cattery, Voluntary Breeder and CFA’s Cattery of Excellence certification for several years. Our Ocicats are our pets, companions and fur children. We are a small boutique size cattery, whereas our kittens are raised under foot and with my two grand children. The kittens are well adjusted when they are placed in their homes. The Ocicat originated in Michigan from an interbreeding of Abyssinian, Siamese, and American Shorthair, which gives it a wonderful well rounded personality, coming in 12 colors and 4 varieties. There is no wild blood in the Ocicat, they just look wild with all of their beautiful spotted markings. The Ocicat is an active cat; can open doors, play fetch, use the toilet, talk on command, walk on a leash or just about anything that you are willing to teach them. They are great with other animals and children. 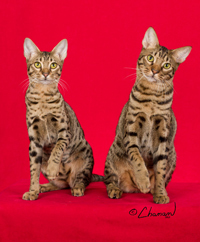 The Ocicat is easy to care for with their short sleek coats and need minimum care to always look beautiful. If you are looking for an interactive cat, companion, look no further the Ocicat embraces all! 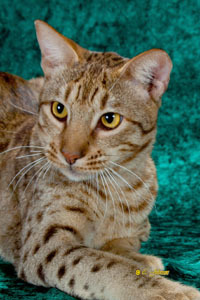 We have Ocicat kittens, young adults and retired show adults available.